I’ve a terrific new book you need to add to your queue, and I’ll bet you learn lots you hadn’t known before. That’s because the subject is the granddaddy of the Tudor dynasty, the financially-meticulous Henry VII. 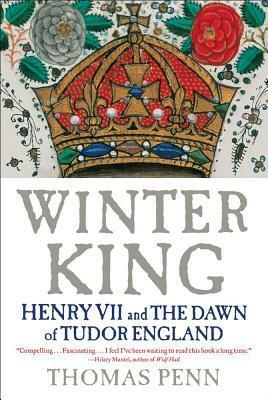 The Original Henry Tudor so often takes a backseat to his dramatic, indulgent, matrimonially-capricious son. Thomas Penn’s biography is going to change all that! First, I’m obligated to mention that I received a complementary copy of Winter King from Simon and Schuster. So thank you very much, Simon and Schuster! That was lovely. Winter King is 378 pages in length. My attention span is too poor to stay riveted for long, although I’m the same person who’s knocked out 800 pages of Harry Potter in under 24 hours. My selective ADD not withstanding, I found Winter King to be a perfect length for its subject. It is divided into manageable chapters and never gets stagnant, partly because the events and people are rather thrilling and partly because the book is masterfully crafted. Thomas Penn takes a firm hold on your interest from the word go and keeps it until the bibliography. Henry VII’s gravity is palpable straightaway. But while Penn opens doors we hadn’t cracked previously regarding the senior Tudor’s personality, the Welshman still remains as a whole behind his familiar veil of mystery. I enjoyed the many social details, such as Henry VII’s telling his 2nd son of plans for the boy to marry Catherine of Aragon, widow of Henry’s oldest son and late heir. And it’s satisfying to see Margaret Beaufort pop up often, such as when her son (who, apparently, never stopped being her little boy) needs the post-medieval equivalent of chicken soup and a big hug. If military history is more your speed, there is plenty of that too, naturally, given Henry VII’s reign and its challenges. Military history tends to be quite “Charlie Brown’s teacher” for me, but it’s especially necessary in early Tudor history so I just dealt with it! The Prince Arthur / Catherine of Aragon “did they or didn’t they?” question is prominently featured, as is Catherine’s sister Juana. After having read about Juana here, I am compelled to learn more about her so I see Sister Queens in my near future. There’s an interesting and pertinent passage on Machiavelli’s well-known “better for a prince to be loved or feared” question. Thomas Wriothesley’s accurate sketch of the king’s death scene is included in the illustrations. Do check out this video where Thomas Penn talks briefly about his book. Did I mention this is his first book?? I think you will find that as hard to believe as I do once you’ve read it. Enjoy!